Home > Electrical, Maintenance & Cable Management > Lockout Products > Safety Lockout Signs > Caution lock out procedure in operation, authorised personnel sign. Caution lock out procedure in operation, authorised personnel sign. Do not tamper with lockout devices sign. Permits to work must be obtained symbol and text safety sign. Caution lock out procedure in operation, authorised personnel only to remove lockout sign. Magnetic lockout safety sign. Lockout safety sign. Caution lock out procedure in operation, authorised personnel only to remove lockout. 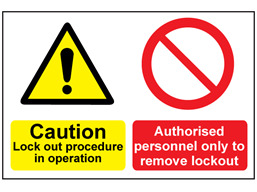 Multipurpose safety sign for the safe lockout during maintenance or operation of machinery, plant or equipment. Material magnetic, suitable for removal and re-use. Size 150mm x 225mm.